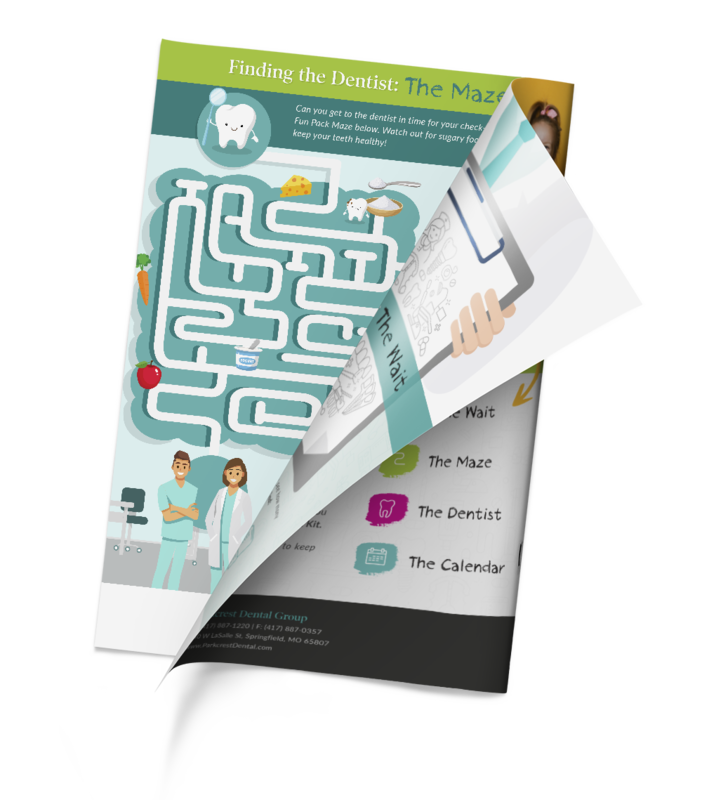 While you’re waiting to see the dentist, you can enjoy a few things to do in our Dental Fun Kit. The main goal of our general dentistry practice is to preserve your natural teeth and keep them as healthy as possible. Pediatric dentistry is no different. However, even with children, sometimes the need arises for tooth extractions. Although most baby teeth (or “milk” teeth) are deciduous and will come out on their own, there are a few different reasons why our pediatric dentist, Dr. Stuart Scott, will recommend an extraction. Baby teeth that don’t grow into the proper position may inhibit the permanent teeth from coming in properly. While tooth extractions aren’t ideal, letting your pediatric dentist extract disruptive baby teeth could prevent the need for orthodontic treatment later on. In some cases, Dr. Stuart Scott may recommend tooth extraction because of decay or disease. It’s also common for little ones or young people who play sports to have accidents that break, crack, or knock out teeth. Your pediatric dentist will do everything he can to save the tooth, but sometimes tooth extraction may be necessary. Wisdom teeth removal is also part of pediatric dentistry and is often recommended for impacted wisdom teeth. Extracting them early can prevent damage to neighboring healthy teeth, bone, gum tissue, and even nerves and blood vessels. In addition, extracting a badly positioned wisdom tooth early will often be easier on your child because the roots are not yet fully formed. Dr. Stuart Scott is our pediatric dentist here at Parkcrest Dental Group in Springfield, MO. His expertise in pediatric dentistry allows him to make the right call when it is necessary to extract a tooth. He will do everything he can to save your child’s teeth, but when one tooth could negatively affect the rest, he may make the judgment call to extract it. The Parkcrest staff works hard to provide a positive experience for your child, so Dr. Scott takes every step to make the process as easy as possible. One thing you can do for your child is to make the conscious decision to never scare them about losing teeth or going to the dentist. Having an optimistic attitude about pediatric dentistry can keep your child from experiencing anxiety. Dr. Stuart Scott and the Parkcrest Dental Group staff will do their part to make the dentist’s office a positive environment, but your help in shaping perspective about it will benefit your child greatly. While Baby Bottle Cavities tend to start in the front and work their way back, cavities in older children are more common the darker, more difficult to reach places of the mouth. The back molars, both in baby teeth and permanent teeth, have deep grooves and pits on the chewing surface. These pits create the perfect hiding place for bacteria that only careful, thorough, and frequent brushing can prevent. One preventative way to fight bacteria in these grooves is to apply dental sealants to the teeth. The application of dental sealants is also a service our pediatric dentist, Dr. Scott, provides. The second location most susceptible to cavities is in between the teeth. The space between most teeth is too small for the bristles of your toothbrush to reach, and bacteria can easily hide there. The good news? Floss can reach and remove the bacteria hiding in these dark corners and crevices. For this reason, Dr. Scott recommends flossing every day. If you are looking for a pediatric dentist in Springfield, MO, Dr. Stuart Scott at Parkcrest Dental Group will be an excellent introduction to pediatric dentistry for both you and your child. He will make the experience enjoyable and easy, while also teaching your little one about the importance of dental hygiene. Contact our office today to schedule your first appointment.